HILAVICKS PAVINGSTONES & CONCRETES INC. is a manufacturer, supplier, seller and installer of interlock paving stones, blocks and tiles. 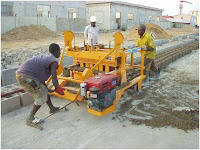 It is a concretes industry which strives to achieve customers’ satisfaction through careful quality production, quality supplies and skilled installation of interlock paving stones, blocks and tiles. Hilavicks offers a consistently excellent innovation that promotes and ensure complete illumination of homes and houses. With our highest standards in the business, we confidently recommend our products and services to customers and populace. Hilavicks is located in almost all the geo-political zones in Nigeria.Due to business expansion, we are seeking to recruit young professionals for MANAGEMENT TRAINEES job.All enrolled trainees are expected to receive allowance to cover essential expenses during the duration. Applicants should possess a degree or HND in science or art disciplines from a reputable higher institution, and must have completed his/her NYSC.Applicants without work experience will be considered. Applicant must exhibit excellent command of written and Spoken English.